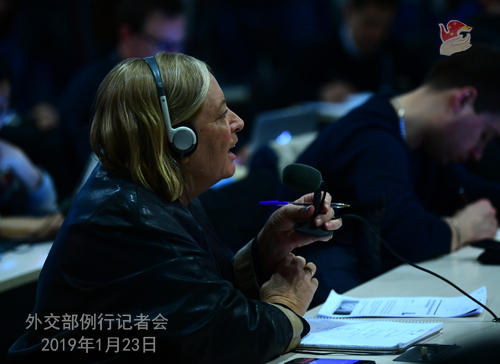 Q: In recent interviews with The Paper, French and Italian ambassadors to China both made positive comments about their countries' relations with China. We have noted that State Councilor and Foreign Minister Wang Yi will visit France and Italy and hold relevant meetings. Could you provide more information? A: I have noted the positive remarks of the two ambassadors on China-France and China-Italy relations respectively in interviews with The Paper. We welcome and appreciate that. As you know, we have released the information that State Councilor and Foreign Minister Wang Yi will leave today for France to attend the 18th session of the consultation of the coordinators for the China-France Strategic Dialogue, visit Italy and host the 9th Joint Meeting of China-Italy Government Committee. China-France and China-Italy relations both enjoy sound momentum of growth. China and France are comprehensive strategic partners. The two sides enjoy frequent high-level exchanges, deepening cooperation in such areas as nuclear energy, space and aviation, agricultural products, environment, finance and third-party markets, as well as increasingly dynamic people-to-people and cultural exchanges. As this year marks the 55th anniversary of the establishment of diplomatic ties between China and France and the 100th anniversary of the Chinese Diligent Work-Frugal Study Movement, the two sides have agreed to jointly hold a series of celebratory and commemorative activities. The upcoming session of consultation will be the first since State Councilor and Foreign Minister Wang Yi assumed the role of coordinator for the China-France Strategic Dialogue. The two sides will have an in-depth exchange of views on bilateral relations and international and regional issues of mutual interest. This will further cement political mutual trust, enhance cooperation in various sectors, and bring China-France relations in the new era to a new height. As this year marks the 15th anniversary of the comprehensive strategic partnership between China and Italy, and next year will mark the 50th anniversary of diplomatic ties, the development of China-Italy relations is presented with new opportunities. China attaches great importance to growing its relations with Italy and stands ready to work with the Italian side to implement in real earnest the important consensus reached by our leaders, further enhance high-level exchanges, consolidate political mutual trust, deepen practical cooperation in key areas and work together under the Belt and Road Initiative to elevate our comprehensive strategic partnership to a new level. During State Councilor Wang Yi's visit to Italy, the two sides will have an in-depth exchange of views on China-Italy and China-Europe relations as well as international and regional issues of mutual interest, and will work under the framework of the China-Italy Government Committee to actively coordinate and promote exchanges and practical cooperation in various fields. We have every confidence that this trip by State Councilor Wang Yi will inject fresh impetus into the development of bilateral relations. Q: UN Secretary-General António Guterres recently announced the appointment of Xia Huang, the former Chinese Ambassador to the Republic of Congo, as his Special Envoy for the Great Lakes Region. What is your comment? A: China welcomes the appointment of Ambassador Xia Huang as the Special Envoy of the Secretary-General for the Great Lakes Region by UN Secretary-General António Guterres. Ambassador Xia Huang, as an experienced diplomat, has been long and deeply engaged in African affairs and knows the issue of the Great Lakes Region very well. We believe that Ambassador Xia Huang, as the first Chinese serving as the Special Envoy of the UN Secretary-General for hot-spot issues, will contribute to the efforts made by the UN to realize peace, stability and development in the Great Lakes Region. China will also actively support Secretary-General António Guterres and Ambassador Xia Huang in achieving this end. Q: Reports say that Australia is investigating the whereabouts of one of its citizens, Yang Hengjun, whose friends said that he may have disappeared or been detained in China. Can you confirm that? A: I am not aware of the situation you mentioned at this point. I need to check on that with the competent authority. Q: Will a formal US extradition request to Canada for Meng Wanzhou, which is due on January 30, impact the China-US trade talks? A: You raised a hypothetical question, so there is no need for me to answer it. However, I want to use this opportunity to reiterate our solemn position on the Meng Wanzhou case. I have to point out that the extradition the US is seeking in its request to Canada is essentially related to the US sanction bills on Iran. But as you may all have known, Huawei for many times has solemnly stated that it complies with all applicable laws and regulations where it operates. I want to stress in particular that China holds a consistent position on opposing the US unilateral sanctions on Iran outside the framework of the UN Security Council. What the US has done does not accord with the international law and has been opposed by the whole world, including its allies. The Canadian side is also opposed to that. Therefore, the US actions, fundamentally speaking, do not comply with the international law and are not legitimate at all. Its actions are highly political and are in nature scientific bullying. The real motive of the US side is clear for all to see, who is leaving no stones unturned in containing China's hi-tech companies and depriving China of its legitimate development rights. I believe that whoever that sees things clearly and has a sense of justice should voice their firm opposition to that. Q: Could you confirm that Vice Premier Liu He is still scheduled to go to the US for trade talks from January 30 to 31? A: Regarding Vice Premier Liu He traveling to the US for trade talks, the Spokesperson for the Commerce Ministry has issued relevant information. As far as I know, the two sides maintain communication in this regard. As to the specifics, I would refer you to the Commerce Ministry. 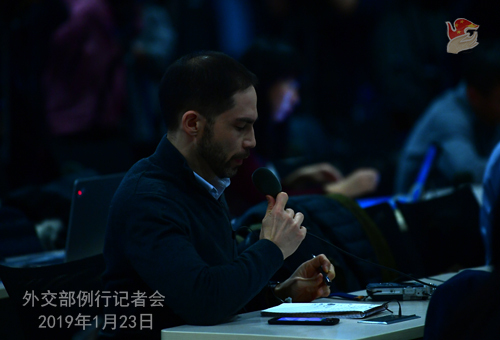 Q: Could you confirm the report that the US canceled preliminary trade meeting between the US and Chinese officials ahead of Vice Premier Liu He's visit to the US? A: I have seen relevant reports. I have also noted that actually the US officials have made clarifications on that. The Spokesperson for the Commerce Ministry has said before that China and the US maintain communication on trade talks. I have not heard of any changes in this aspect. As for the specifics, I may still refer you to the Commerce Ministry. Q: The newly released US National Intelligence Strategy report identified Russia and China among some of the major threats to the US, and it said that China's military modernization and continued pursuit of economic and territorial predominance in the region remain a concern. I wonder if you have any comment on that? A: We have also noted the report. Recently the US has released a series of similar reports, which levied some groundless accusations against China and Russia. We are opposed to that. 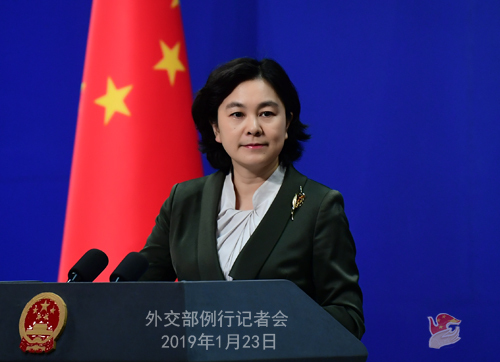 We have stressed many times that China remains committed to the path of peaceful development and firmly pursues defense policies that are defensive in nature. Just as you have seen, China is always an architect for world peace, a contributor to global development and a guardian of international order. 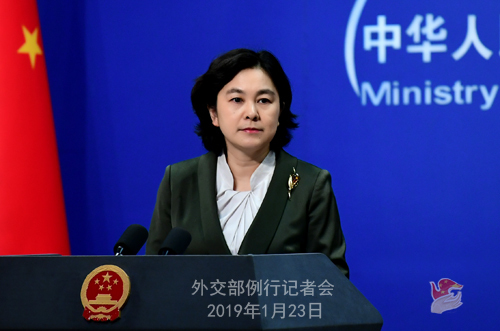 China once again urges the US to abandon the outdated Cold War mentality and zero-sum game mindset and contribute more to the mutual trust and cooperation between China and the US as well as the peace and stability of the world. Q: I'd like to ask about State Councilor and Foreign Minister Wang Yi's visit to Italy. When he goes to Italy, does he have any plans to meet with the Vatican officials or visit the Vatican? A: Like I said just now, during State Councilor and Foreign Minister Wang Yi's visit to Italy, the two sides will have an in-depth exchange of views on China-Italy relations, China-Europe relations and international and regional issues of mutual interest. I have not heard of the arrangement you mentioned.